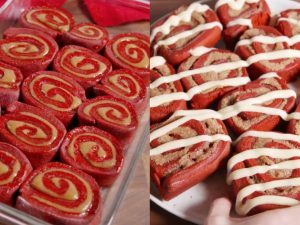 Colored, easy and delicious cinnamon rolls! A quick and tasty version of Cinnamon rolls, perfect for Christmas holidays. 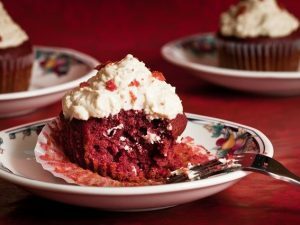 Ingredients: DOUGH: 1/2 c. warm water1 envelope active dry yeast3/4 c. warm milk1 package red velvet cake mix2 1/2 c. all-purpose flourPinch kosher salt. FILLING: 1/2 c. (1 stick) unsalted butter, softened1/2 c. brown sugar1/2 c. granulated sugar1 tsp. cinnamon. CREAM CHEESE ICING: 1/2 c. (1 stick) unsalted butter, softened8 oz. cream cheese, softened1 c. powdered sugar1/2 tsp. vanilla extract1/4 c. milk. 2) When the yeast is active, pour in a bowl and add milk, cake mix, flour, and salt. 4) Filling: In a large bowl, mix together butter, sugars, and cinnamon until well combined. 5) Roll into a large rectangle. Spread filling over the dough and roll up. Slice into 15 rolls. Bake at 375°F (190°) for 18-20 minutes. 6) Cream cheese icing: Beat together butter, cream cheese, sugar, vanilla, and milk. 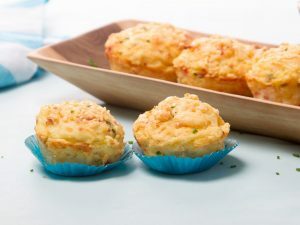 7) Spread on the rolls and serve. 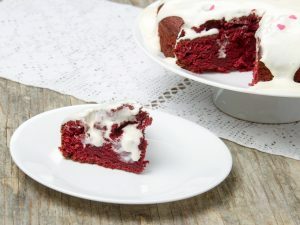 Red Velvet Poke Cake: delight yourself! Apple and Custard Cake: the perfect idea to make a unique cake!